After a flock has been moved to a new area, the old pasture should be raked if there are any patches of compacted droppings, and then ‘topped’ to cut down taller grasses which may be producing seed heads. An alternative is to graze sheep, cattle or goats on the site; they will do all the necessary topping. Some free-range units rent out such land to farming neighbours who require extra grazing, while others graze sheep at the same time as the birds. On a large scale, topping can be done with the traditional farm equipment of tractor and cutting bar. A ride-on garden tractor with the blades set at maximum height is also effective. For small areas, an ordinary hand lawn mower with the blades set high will do the job. Mention has already been made of the need to keep grass short near electric fencing. Regular mowing is the only way to ensure this and a ride-on or hand garden mower is effective in keeping a strip close to the fence clear of tall growth. Grass strimmers have also been used to good effect. Remember to switch off the electric fence before mowing around it! It may also be necessary to mow the area of pasture currently occupied by the birds, if it is growing more quickly than their foraging action can keep pace with. Tall grasses are not eaten by the birds and rank growth, particularly if wet with rain or dew, is a positive disincentive to them. Those which do brave such conditions get their legs and bottom feathers wet, making eggs which are subsequently laid wet and dirty. Once birds have vacated a site, and if other livestock is not being grazed on it, it is a good idea to dust with lime, particularly if the ground tends to be on the heavy or acidic side. 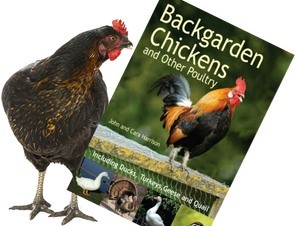 There is some dispute among poultry experts whether this practice helps to deter disease-causing organisms and clear up parasitic infection of the ground. Traditional wisdom has always encouraged it – and what is certainly true is that heavy clay soils are less likely to compact and puddle if treated with lime. A reduction in the number of waterlogged areas will also reduce the incidence of snails which act as intermediate hosts to parasitic flukes and the coccidiosis causing organisms. Liming is a practice I always follow to good effect with my own pasture rotation management. If an area of pasture has deteriorated badly, it may be appropriate to plough it up, harrow it and then reseed it with a new ley mixture. Once it is ploughed, test the soil to determine its pH level of relative acidity or alkalinity and apply lime if necessary. Leave it to weather for a time, then harrow it to break down the clods of earth ready for seeding. All these activities can be carried out by a specialist contractor, if you are not in a position to do it yourself. 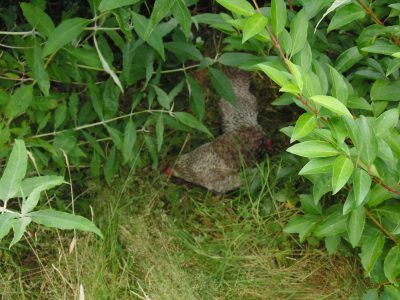 Special ley mixtures for free-ranging poultry are available from some specialist seed suppliers. These mixtures are made up of shorter perennial grasses which are more suitable for poultry than the longer grasses which are usually found in other leys. As a general rule, 50 gm per square metre, or 500 kg per hectare, of seed will be required. A new ley pasture will not generally require feeding in its first year. In the second year, it can be given some nitrogen fertiliser such as environmentally acceptable calcified seaweed.